This is the time of the year when most of us tend to look back and try to “evaluate” or “assess” the last twelve months’ achievements. How has the perception of your child’s diagnosis changed? Did you get over the denial stage yet? Is your partner becoming more supportive and understanding of the situation? Are you and your partner more accepting of your child’s condition than last year? Have you found strategies that helped you lead a more stable and peaceful life? 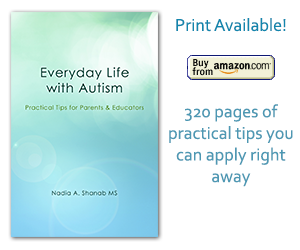 Have you learned more about autism and applied your knowledge to give your child a better chance to progress? Have you established a system of discipline, consequences/rewards, consistency, and daily schedule to suit your child’s need? Is your child adapting and adjusting better than a year ago in school and at home? Do you recognize all the knowledge, habits, and behaviors your child has aquired over the last twelve months? Do you feel more comfortable talking about your child’s condition than a year ago? Are you communicating well with your child’s school staff? Are you joining any forums discussions or support groups? Is your life less isolated than last year? Do you think you are coping better with your child’s condition than a year ago? Have you discovered new strengths in your child and yourself? I am confident that your answers to most of the questions above are positive. You know why? Because this is the nature of life. Life goes on! Time is the best partner, healer, and mentor. The parent’s instict and intuition is too strong to hinder the process of growth and development of their child. The survival instinct drives parents to always make the right choices. You may have not met all the goals you’ve planned for a year ago. Well, were all these goals realistic? Count your child’s strengths, not her deficits. Never give up! Be strong for your family. Stay connected with the world; isolation is poisonous. Keep your child busy and engaged. Early intervention is a key success factor. Don’t wait. Be patient and hopeful, it takes time for the child to grow and develop. Take your cues from your child, don’t look elsewhere. There are no two kids with autism alike. Remember that the two most important goals you are working on are: helping your child become more independent and communicative. Your child is unique! Don’t compare her with anybody else. I wish you all very happy holidays and a prosperous new year 2014!